The Pens suffered a marathon 3 overtime loss Thursday night at Mellon Arena that left everyone banged up, sore, tired, and just in an overall bad mood. Oh, and by the way....Your plane for Ottawa leaves tomorrow. Matt Carkner tipped in the game winner about 7 minutes into the third overtime to give the Sens the 4-3 win and pull them back to 3-2 in the series and going back home for game 6. Of course, that might not be the best thing given the way this series has gone. Only one game so far has been won by the home team, which was the Penguins in game 2. Still, though, this game would have greatly helped the Pens as they have been dealing with injury and fatigue problems. The game started out much like it ended, bad for the Pens. The Senators scored two quick goals by Mike Fisher and Jarkko Ruutu, and it was not until the end of the period that the Pens regained their bearings. Kris Letang scored a powerplay goal to pull the Pens within one. The second was actually quite uneventful until Chris Kunitz poked one past Leclaire that was originally waved off but given back to the Pens after replay review confirmed the goal. Sidney Crosby put the Pens up 3-2 midway through the second with a diving goal that was more than worthy of the highlight reel. 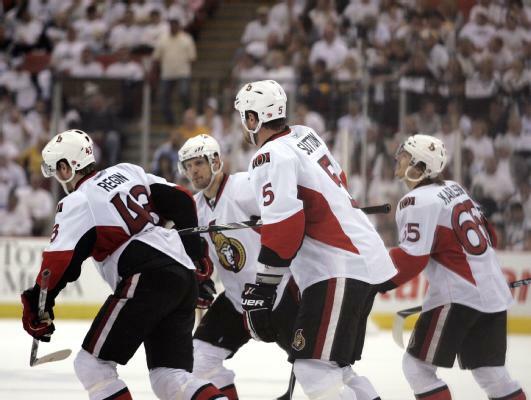 The Sens answered right back though when Peter Regin beat Fleury with a long, hard slap shot to tie the game up. This would be the last of the scoring until Carkner's overtime winner. When you simplify the game, it all boiled down to a goaltending battle. And while Fleury played very well (40-44 shots), Pascal Leclaire won the game for Ottawa. He stopped 56 total Penguins shots, and was incredibly sharp in the late stages of regulation and all throughout overtime. If he continues to play like this, closing out the Senators will quite difficult and Brian Elliott may not get his spot back as the starting goalie. Game 6 is Saturday in Ottawa, and while it is not a must win for the Pens, they should try to avoid the Game 7 at all costs.